Perhaps don't get your hopes up too high, but Arnold Schwarzenegger still wants to make The Legend of Conan, or at least that's what it was being called at one point or another. 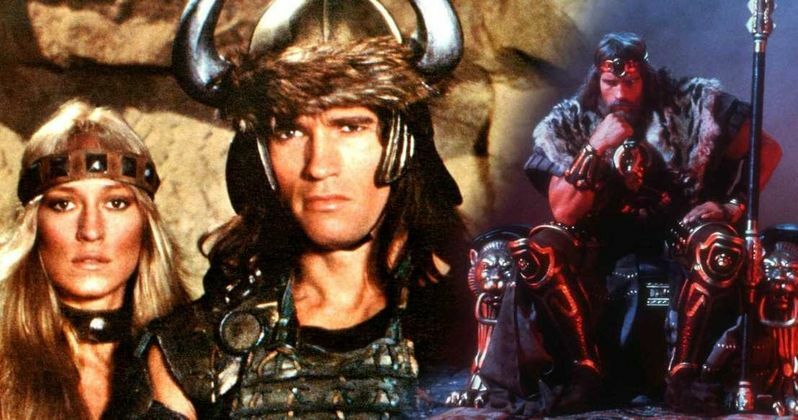 In any event, it would be the third movie in his Conan series that would see the iconic action star returning to the role decades later in sort of an "Old Man Conan" take on the material. While the project may not have any life officially, as far as we know, Schwarzenegger is still game. Marvel recently released the first issue of their new comic Conan the Barbarian #1, which comes from Jason Aaron (The Mighty Thor) and Mahmud Asrar (All-New, All-Different Avengers). Arnold Schwarzenegger took to Twitter to share his excitement and love for the book, which features him back in his glory days as Conan on the cover. At the end of the brief video, after gushing over the book. Arnold Schwarzenegger had this to say. "It's a movie that I've wanted to do for a long time. Let's do it." The 71-year-old actor is even seen sitting on a throne in the video, which helps paint an image of what it would be like to see Conan all these years later, after ruling for decades. For the past few years, he's been referring to it as "Conan the Conqueror" and does so again here in the video. A few years back, he described the pitch for the movie as follows. Related: King Conan Poster Returns Arnold Schwarzenegger to the Throne! "Conan the Conqueror, where I'm sitting on the throne for years and years, decades, and then all of the sudden, the time comes when they want to overthrow me. So that story will be told and that movie will be done." Chris Morgan, known for his work on the Fast and Furious franchise, penned the screenplay, at least the one that was floating around for a while. Unfortunately, the studio seemed to have other ideas and the movie never got off the ground. Budget, amongst other things, reportedly got in the way. However, the desire is still there and, if anyone can will this project into existence, it's Arnold Schwarzenegger. He's about to be playing the Terminator for a fifth time. Why not let him play Conan for a third? After all, Hollywood has been giving the green light to many long-awaited sequels in recent years. Arnold Schwarzenegger originated the role very early on in his career in 1982's Conan the Barbarian. That was followed up by 1984's Conan the Destroyer and, by that time, thanks to The Terminator, his career had taken off. And so, that iteration of the franchise has sat collecting dust. But maybe now that he's nearly done working on Terminator 6 and has since recovered from his heart attack, he can find a way to make this happen. Be sure to check out the video from Arnold Schwarzenegger's Twitter account below.